Retail Strategies was engaged by the city of Spring Hill in 2014. We identified a leakage of $22 million in the full-service restaurant category, and predicted that the market could support 5 additional restaurants. Through the course of the past 2 years we have reached out to dozens of restaurants on behalf of the city of Spring Hill to be an advocate for the market. We are pleased to see that Red Robin will be opening. we encourage the residents of spring hill to dine at red robin and support the new business. This new business can generate an additional $50,000 in sales tax collections for the city and employ over a dozen people. Retail Strategies will continue to pursue full-service restaurants and other retail categories to the city of Spring Hill. We are honored to be partners with such a vibrant community! Spring Hill’s much-anticipated Red Robin restaurant will open for business Oct. 24, but customers can eat at the restaurant a little earlier through a sneak preview celebration that begins Wednesday, Oct. 19. 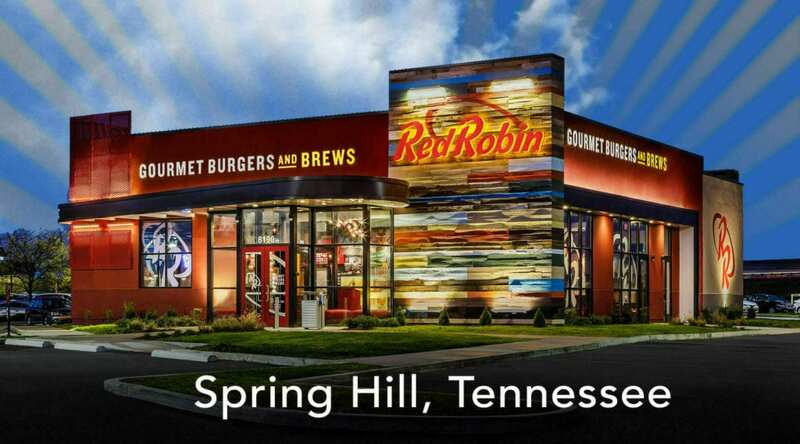 As with other restaurants, Spring Hill residents have eagerly awaited the opening of Red Robin since it was first proposed last year. Restaurants remain in high demand in Spring Hill, primarily because of the city’s rapid growth and the number of young families drawn to the area. In a recent retail market research study performed for the city of Spring Hill, consultant firm Retail Strategies found that full-service restaurants represented the city’s largest market gap of about $22 million, reflecting the degree to which consumers travel outside the community for certain retail goods and services.